Engage and soothe young children before bedtime with a personalized story that incorporates their name on the cover, in the story, and even in the illustrations. In this lyrical lullaby, a Goodnight Parade marches through your child's sweet dreams: sheep come a-leaping, dogs dance in a kick line, crickets chirp and owls hoot-hoot. This lasting keepsake is a unique baby gift for baby showers, growing families, new parents, grandparents, aunts, uncles, or other loved ones. 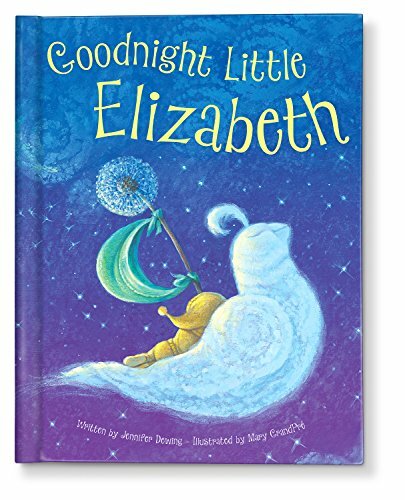 Reading this special goodnight to your child is sure to become a favorite nighttime ritual. Written by Jennifer Dewing and illustrated by Mary GrandPré, award-winning illustrator of the Harry Potter books (U.S. editions). Hardcover; approximately 20 pages. 9 x 11 inch. Made in the USA. Winner Mom's Choice Gold and PTPA Awards. UNIQUELY PERSONALIZED BABY BOOK - This bedtime book includes your child's first and last name, birthdate, the year this book will be given and the sender name(s) for the dedication page. UNWIND BEFORE BEDTIME - Begin a new nighttime ritual with this engaging, personalized story that lulls your child to sleep. OUTSTANDING ILLUSTRATIONS - Each page is beautifully illustrated by Mary GrandPré, award-winning illustrator of the Harry Potter books (U.S. editions). HIGH QUALITY - This 20-page, 9 by 11-inch hardcover book is made in the USA and is perfect for boys and girls ages 0-6. If you have any questions about this product by I See Me!, contact us by completing and submitting the form below. If you are looking for a specif part number, please include it with your message.